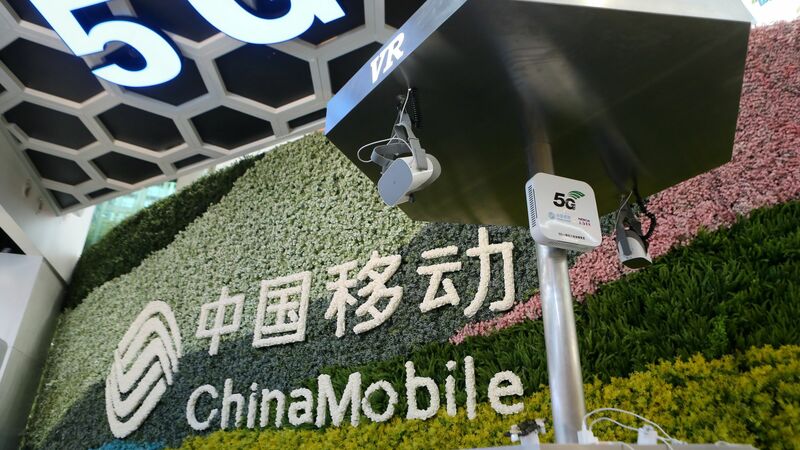 China Mobile 5G experience area in Shanghai, China. Photo: Wang Yadong/VCG via Getty Images. Federal Communications Commission chairman Ajit Pai is recommending, per executive branch agencies, that the FCC deny China Mobile's application to provide telecommunications services in the U.S. due to concerns about national security and law enforcement risks. Why it matters: It's the first time executive branch agencies have recommended that the FCC deny such an application to interconnect with U.S. communications infrastructure, FCC officials said Wednesday on a call with reporters. The move represents a further escalation in the slow-building conflict between the U.S. and China over telecommunications trade. The bigger picture: The Trump administration has already blocked Chinese telecom equipment maker Huawei from selling to American companies on national security grounds, driven largely by fears that China could use 5G network equipment to spy on Americans. China is seen as the country to beat in deploying next-generation wireless infrastructure. Last week the FCC unveiled efforts to give the U.S. a leg up in the 5G race against China. Details: China Mobile's application, submitted in 2011, requested permission to provide telecom services in the U.S., including connecting calls between the U.S. and the vast majority of countries, which would involve interconnecting with American internet networks. FCC officials say China Mobile USA is indirectly and ultimately owned and controlled by the Chinese government. It's a subsidiary of global telecom giant China Mobile Limited. U.S. officials saw risks that China Mobile would comply with government espionage requests or that information about U.S. communications networks and users could be exploited. There were also concerns that Chinese government officials could use its access to U.S. networks to block or interfere with communications traffic should an issue arise between the two countries. After consultation with the intelligence community, executive branch agencies concluded those risks couldn't be resolved through a voluntary mitigation agreement. Mitigation agreements require a baseline level of trust between parties, which does not exist in this case, per an FCC official. What's next: The full commission will vote on Pai's recommendation at its May 9 meeting. President Trump and his top telecom regulator will announce plans today to unleash the largest-ever swath of radio frequencies in the U.S. and a $20 billion fund to help wireless companies to keep pace with global rivals — specifically China — in the 5G race. Why it matters: Proponents maintain that a significant economic advantage will be won by the first country to broadly deploy 5G networks, which will deliver wireless speeds 100 times faster than today's mobile internet. The U.S.'s lead in building current 4G technologies led to smartphone ubiquity and apps like Uber and Spotify. The next generation is expected to power self-driving cars and smart cities. Fears that China has the edge in the global 5G race sparked some (including Karl Rove, Newt Gingrich and Trump campaign manager Brad Parscale) to call for a government-directed national network, similar to China's own approach. The White House disagrees. "The Trump Administration is supportive of a private sector, free enterprise approach," per a White House official. "We believe the U.S. is winning the race to 5G with record deployments in cities across the United States." So does the Federal Communications Commission, which oversees the nation's communications networks. "I draw the lesson from the development of the wireless industry over the past three decades, including U.S. leadership in 4G. The market, not the government, is the best way to drive innovation and investment. That's the general approach we've taken and it's proven to be successful." Details: At a White House event today, Trump and FCC Chairman Ajit Pai plan to make two announcements. 1. Airwaves: The FCC will auction off three big slices of millimeter-wave airwaves that are crucial to connecting new devices at high speeds. The auction, slated to begin Dec. 10, will offer the wireless industry the biggest-ever chunk of airwaves the FCC has ever auctioned off for commercial use. 2. Funding: The agency will announce a "Rural Digital Opportunity Fund" to spend $20.4 billion over 10 years in rural broadband. The investment will be made in the form of subsidies available to eligible companies through a competitive auction to build out fiber lines in unserved areas. Fiber-optic infrastructure is expensive to install, but it's essential to carrying wireless network traffic back to the core of the internet. The initiatives are part of the FCC's "5G Fast Plan" to position the U.S. ahead of competitors. Yes, but: The U.S. is hampered in other areas. No American company manufacturers 5G network equipment, leaving the U.S. to rely on foreign-owned Nokia, Ericsson and Samsung. China is poised to dominate that market with Huawei, its fast-growing telecom firm that has been shunned by the Trump administration out of fears of espionage. Dominating the equipment market could give China extra influence in setting future standards as the technology evolves. The wireless industry is aggressively pushing the FCC to free up more "mid-band" airwaves that can carry signals over further distances. This will be important for serving less urban areas. The bigger picture: Wireless companies including Verizon and AT&T are in the early stages of 5G roll-outs, with limited services in handful of markets so far and 92 deployments planned by the end of the year. But widespread deployment will happen over the course of a decade, requiring a steady pipeline of spectrum and fiber projects. "Virtually every sector of the economy is dependent on wireless technologies," Pai said, including areas like ports, mines, manufacturing and agriculture. "To advance the ball, these critical building blocks are absolutely essential."